November 23, 2012 (FSM Embassy, Beijing) A milestone achievement in the FSM-China relations was realized with the commissioning of FSM Honorary Consul, Dr. Tan Siu Lin and the unveiling of the Office of the FSM Honorary Consul in Hong Kong. Dr. Tan Siu Lin is the Chairman of Tan Holdings Corporation. 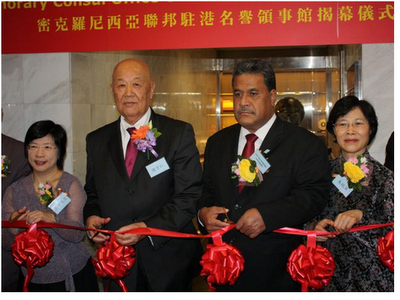 His Excellency, Akillino H. Susaia, Ambassador Extraordinary and Plenipotentiary of the Federated States of Micronesia to the People’s Republic of China was in Hong Kong to witness and participate in the unveiling ceremony of the Honorary Consul’s office at the Nanyang Plaza in the Kowloon side of Hong Kong on November 23, 2012. Representatives of the Hong Kong Special Administrative Region (SAR) Government as well as the Chinese Central Government were in attendance for this historical occasion along with various Hong Kong business representatives and friends of the FSM. In a statement during the ceremony, Ambassador Susaia extended congratulations from President Mori and conveyed the FSM Government’s appreciation to Dr. Tan for his willingness to serve as the first FSM Honorary Consul in Hong Kong. He also said that with Dr. Tan’s business knowledge and understanding of the Micronesian region, he will be able to promote the FSM as a tourist and investment destination. Both sides agree to work together to advance further FSM and China’s model relationship. Immediately after the unveiling ceremony, Honorary Consul Dr. Tan hosted a seminar for economic and cultural exchanges among China and the Pacific Islands Countries at the Park Lane Hotel in the Causeway Bay area of Hong Kong. Ambassador Susaia was one of the keynote speakers at the seminar. He encouraged Hong Kong’s private sector representatives at the seminar to consider the FSM as their next tourism and investment destination. Dr. Tan’s appointment as the FSM Honorary Consul in Hong Kong further extends the promotional arms of the FSM in Asia. Aside from Hong Kong, the FSM also has Honorary Consuls in Korea, Japan, and the Philippines. Accompanying Ambassador Susaia to Hong Kong was First Secretary Vincent Sivas.